As I’ve been reading through the tweets and blogs, I see that even though everybody has to follow the same 15 rules to be an official finisher, people have still customized the challenge and their coffeeneuring rides. Some Oregon coffeeneurs (who also randonneur, incidentally) have approached the challenge as a group event. Last year, Alaska coffeeneur Ted T. set out to complete each ride on a different bike. While I’ve not seen that this year, I see that the duo of What’s Up Wheaton (two of the original coffeeneuring challenge participants) intends to explore eight different coffee shops than those they visited last year. Incidentally, this is Felkerino’s plan, too. Ultrarunnergirl used coffeeneuring to plan a rendezvous with friends (i.e., Felkerino and me!) and also visited a new spot. Pittsburgh has its own social network of coffeeneurs, and many of them are sharing their rides on the Bike Pittsburgh Message Board. I like how they’re sharing their photos and stories, and creating a directory of bikeable coffeeneuring destinations. Some use coffeeneuring as the destination. Others use it as a sub-destination. Aerochick mixed coffeeneuring into the middle of a bike shop visit. Rootchopper coffeeneured during his D.C.-area fall leaf tour. Singularity went coffeeneuring (nice latte art), and then hit the dirt roads. bikelovejones coffeeneured and rode her bike to buy a bike and haul it home. Sounds like the coffee was a bust, but that’s still righteous coffeeneuring, bikelovejones! The Crazy Randonneur said he’s coffeeneuring because he wants to do short trips that get him back into riding after an unfortunate bike accident. While people aren’t always able to officially complete the whole challenge, they’re not letting it keep them from being part of the fun. Rambling Rider and Mr. T in DC are two of those. Pennine Pedaling celebrated her birthday and gave herself a coffeeneuring trip and a group ride as presents. Katy Chancey works an irregular schedule (at least to me, who works a Monday through Friday gig), but notes that she is sticking to using Wednesday and Sunday as her coffeeneuring weekends. A Girl and her Bike perfects the “bike lock + cup of coffee” in her photos and says that, while she could not complete the challenge last year, she plans to do it this year. Awesome! The last couple of weekends have been a celebration of fall. 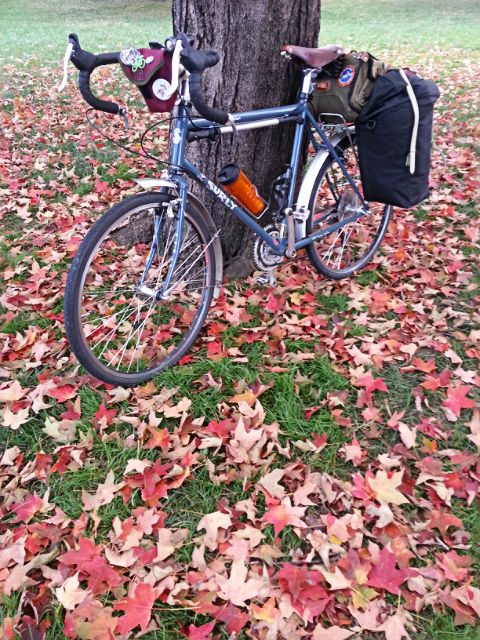 Suze, Cycling‘s post and accompanying photos show that fall is truly here. Pastryneurs. Blog reader Dave C. said to me that he considers himself more of a pastryneur than a coffeeneur. I’ve seen a lot of delicious treats on the coffeeneur tweets and blogs, like this sticky roll from Cruisin’ Downhill. He says the picture is foggy; I say it’s a soft focus. Hudson Valley Randonneur said coffeeneuring inspired him to get out early and sneak in some miles in the outdoors during a busy time. That’s the blog roundup for this week. I also have a RULES UPDATE, which I will also add to the Coffeeneuring Challenge rules post. Rule 16. The Veterans Day Rule: You may coffeeneur on November 12, when Veteran’s Day is observed, INSTEAD of the previous Saturday or Sunday (November 10 and 11). Veterans are permitted to coffeeneur on November 12 in ADDITION to Nov. 10 and 11, in recognition of their service. Rule 16. The Veterans Day Rule: You may coffeeneur on November 12, when Veteran’s Day is observed, INSTEAD of the previous Saturday or Sunday (November 10 and 11). Veterans are permitted to coffeeneur on Nov. 12 in ADDITION to Nov. 10 and 11, in recognition of their service. I like that modification… will update the rules and this post accordingly when I get a chance this evening. Thanks for the mention! My month has gotten exponentially crazy, but I hope to coffeeneur next year! crossing my fingers….